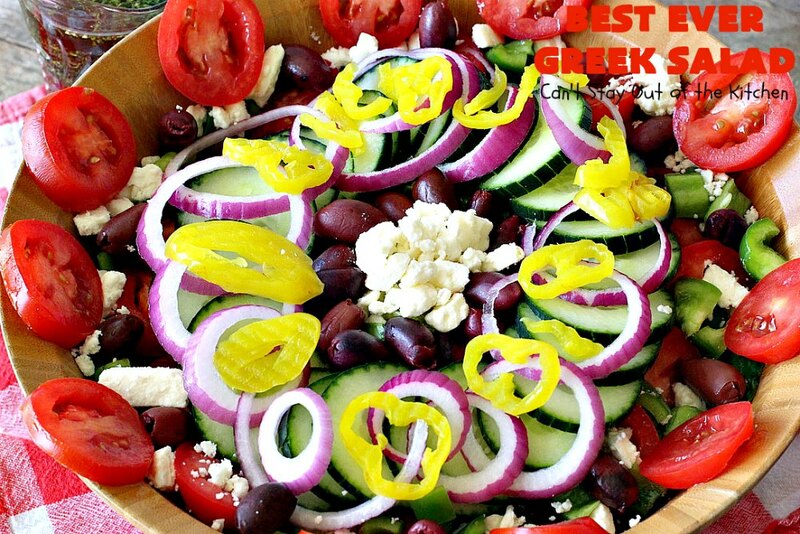 This is truly the Best Ever Greek Salad! The salad dressing alone is absolutely mouthwatering. This is probably my husband’s favorite salad. We serve it a lot for special occasions and for company. (I make it yearly for his birthday). 🙂 It is best if you can make up the salad and pour the dressing over all of it and serve it. But that’s only an option if you plan to eat all of it in one sitting. It’s one of those mouthwatering salads that you just can’t get enough of. I can eat plates and plates of this salad and forget anything else! Mixing all the dressing ingredients with all the salad is the key here. Tossing for a few minutes really infuses the flavors into all the salad ingredients. But that only works if you have a lot of company who are going to be eating the salad. 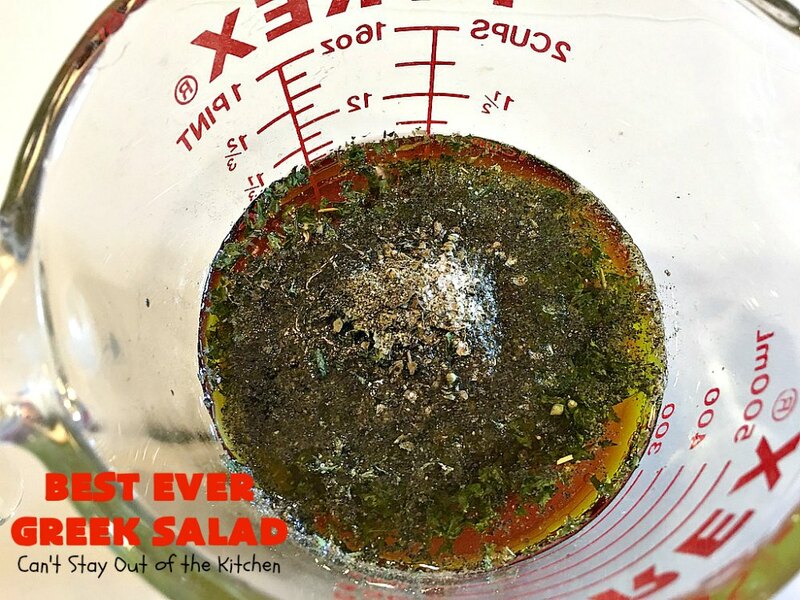 Unfortunately, you really can’t save the leftovers once the dressing is poured over top. The salad will only keep a few hours after the dressing is poured on top. Otherwise the lettuce wilts too much. So most of the time we make it and allow each individual to serve the amount of dressing on top that they like. I started with a recipe for Tomato-Feta salad from a good friend, Mimi Pownall. We had eaten that recipe at her house in the early 1980s. Her husband Ron grew a huge garden in Florida. She was always trying to get rid of some of the tomatoes. She tried a Tomato-Feta salad out on us. It was wonderful. A few years later I was looking through the ingredients for that Greek Tomato Salad. 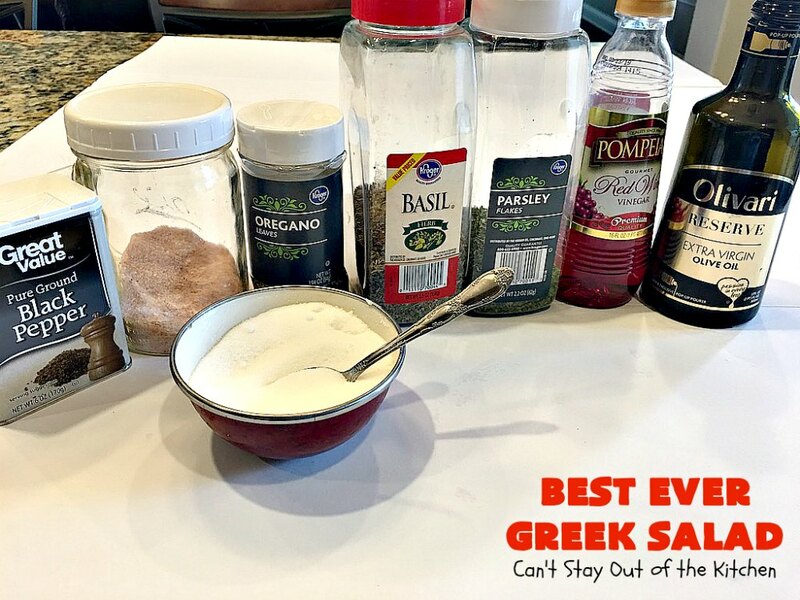 I wanted to try it more as a traditional Greek salad rather than just a tomato salad because the salad dressing is out of this world. This is the salad I came up with and have been making since the late 1980s and early 1990s. 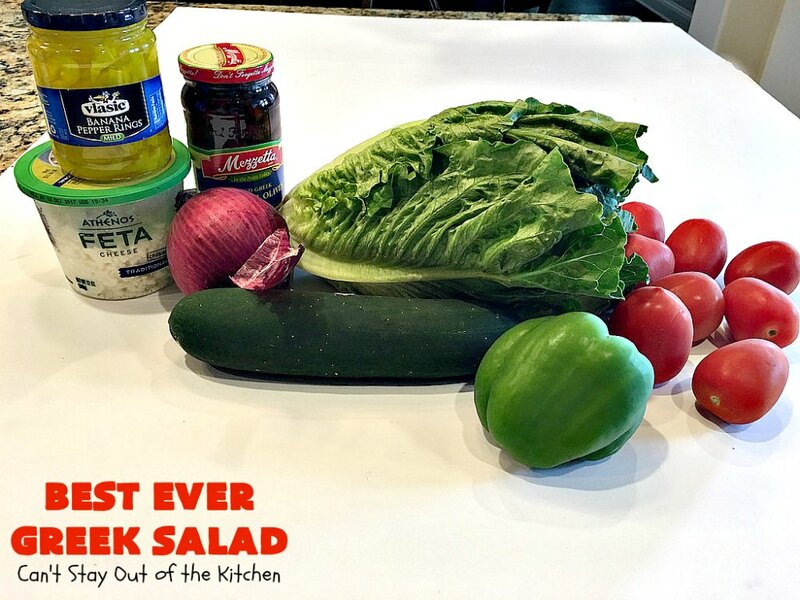 If you’re looking for a fabulous Greek Salad recipe, this will do it! 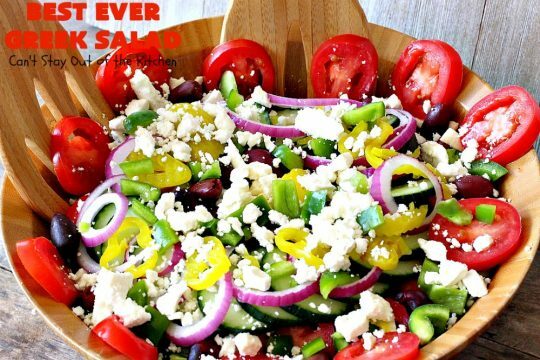 If you just want an amazing salad to eat, this recipe is great enough to be a go-to recipe. While we serve this as a side dish, it’s hearty and filling enough to be a meatless main dish as well. 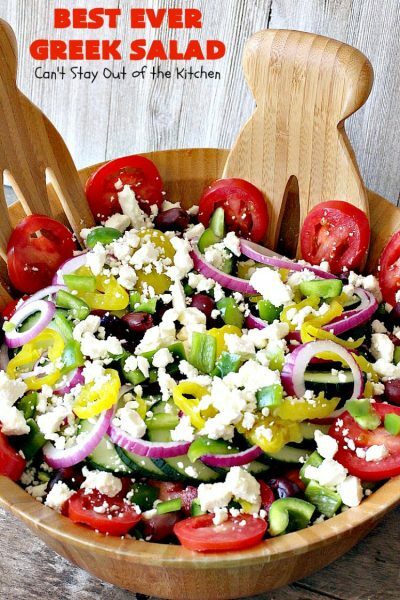 Best Ever Greek Salad is low calorie, healthy and gluten free. And for those of you concerned about the sugar in the salad dressing you can substitute honey instead. I first posted this recipe back in July of 2012 when I was just beginning my blog. My pictures were not very good. So I’ve freshened them up (November 2013) and hopefully you can see a little more detail about why we enjoy this spectacular salad so much. 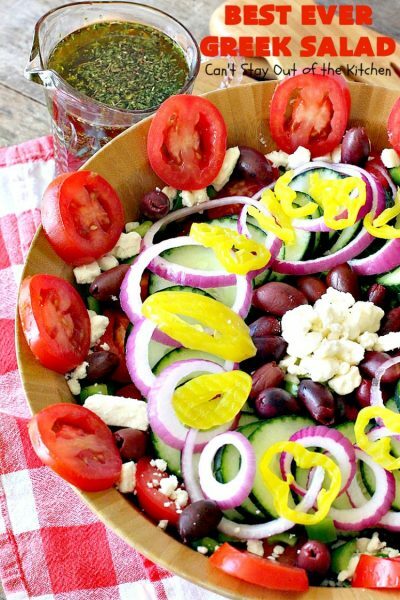 Best Ever Greek Salad will have you drooling. 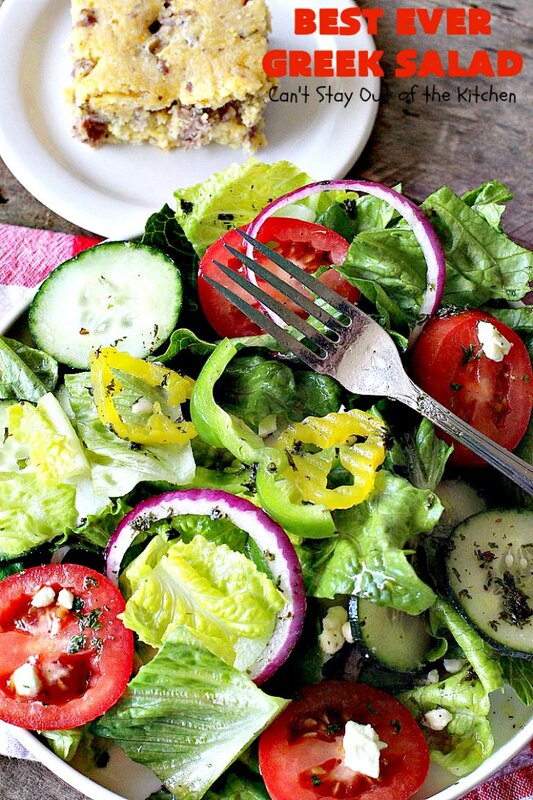 The flavors of the dressing with all the salad ingredients are spectacular. I frequently make Best Ever Greek Salad for company. All our guests LOVE this salad. Here I poured the dressing over an individual serving. But this salad is really fantastic when you actually toss the dressing with the salad ingredients. However, you can only do that if you are planning on eating up ALL of the salad because it won’t keep. Here’s a look at Best Ever Greek Salad ready to serve. 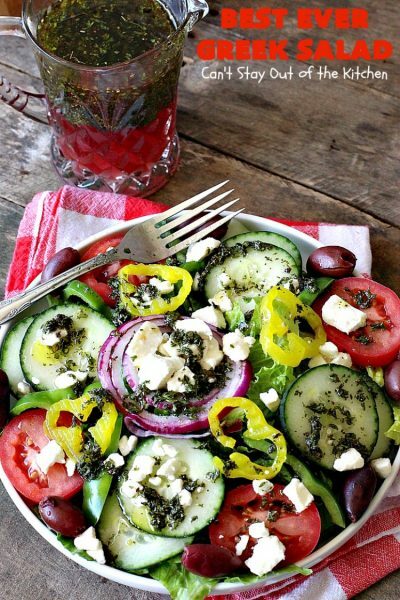 You can sprinkle as much feta cheese on top of the salad as you like. Place romaine lettuce in a bowl. Add tomatoes, cucumber, diced green bell pepper, kalamata olives, salad pepper rings and feta cheese. (I drain the olives and pepper rings and pat them dry with paper towels before adding to the salad). Add extra feta cheese if you enjoy a lot. Refrigerate until ready to serve. I used these ingredients to make the salad dressing. Here’s the salad ready to be tossed with the dressing and served. 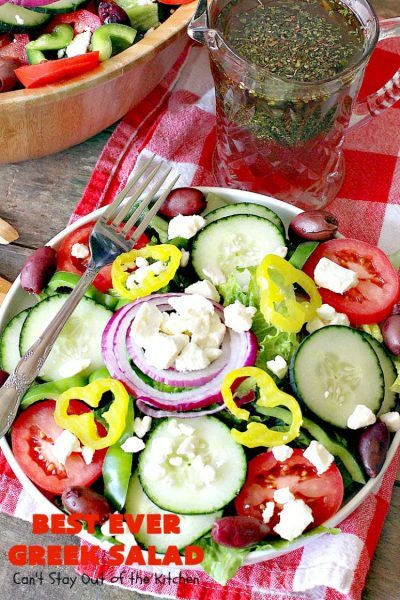 This Best Ever Greek Salad is our favorite Greek Salad recipe. We make it all the time. Here’s a close up so you can see the detail of the salad without the dressing. 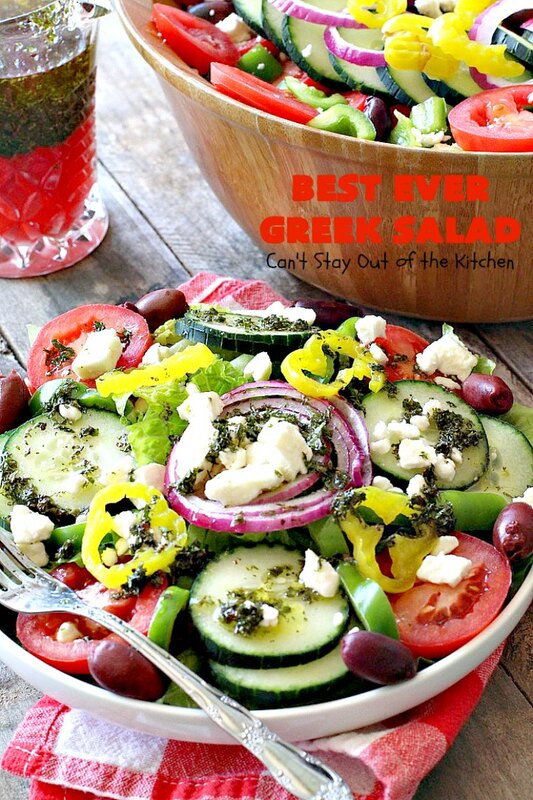 Best Ever Greek Salad is one of the most mouthwatering Greek Salad recipes you will ever taste! I served the salad with Sausage Cornbread, Chicken and Dumpling Casserole and Maple Bacon Sweet Potatoes. Everything was sumptuous. 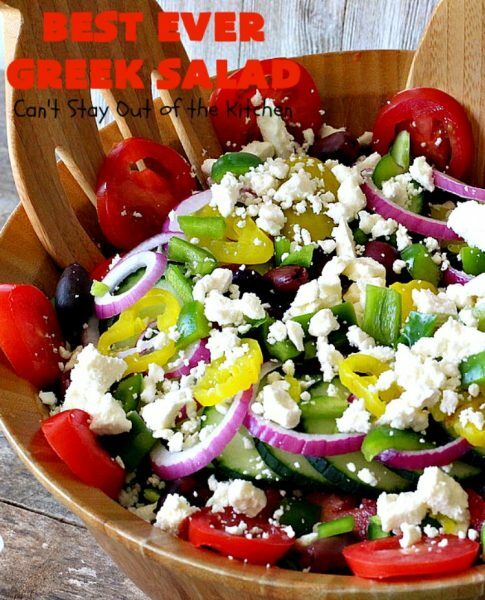 If you want a terrific salad for company, birthdays or holidays, Best Ever Greek Salad is it! 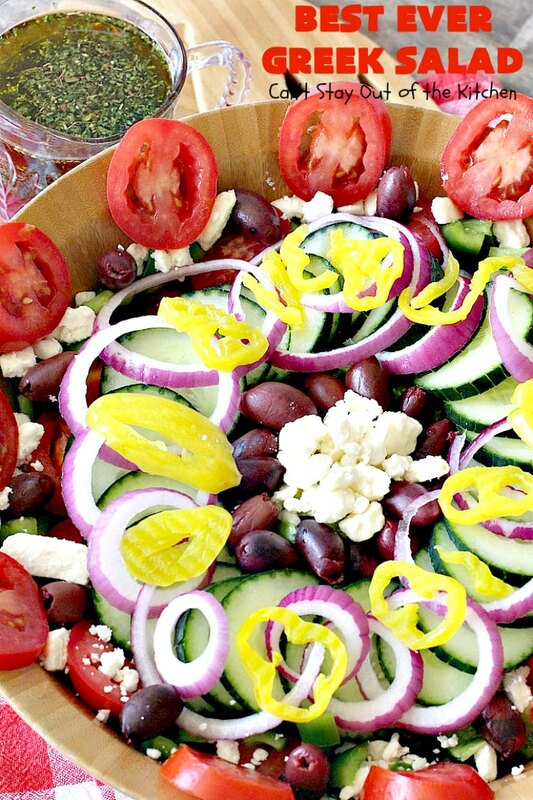 This is absolutely the Best Ever Greek Salad recipe. 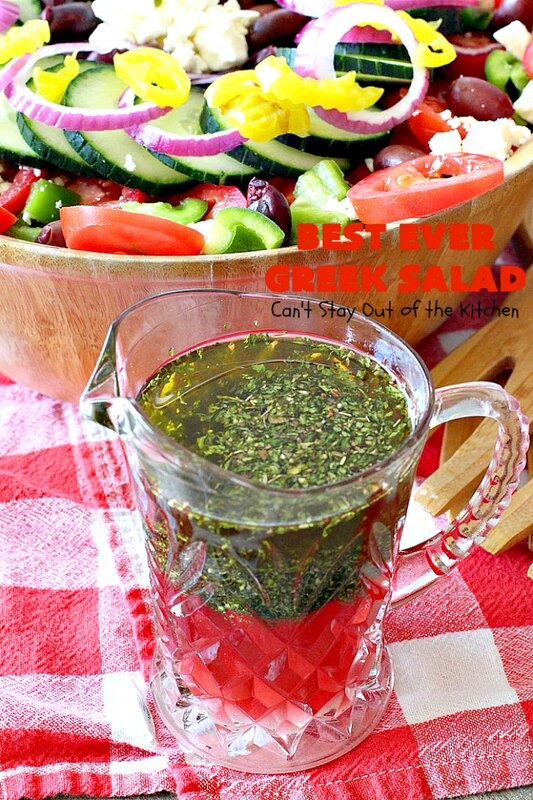 It has a delicious homemade salad dressing that's mouthwatering. 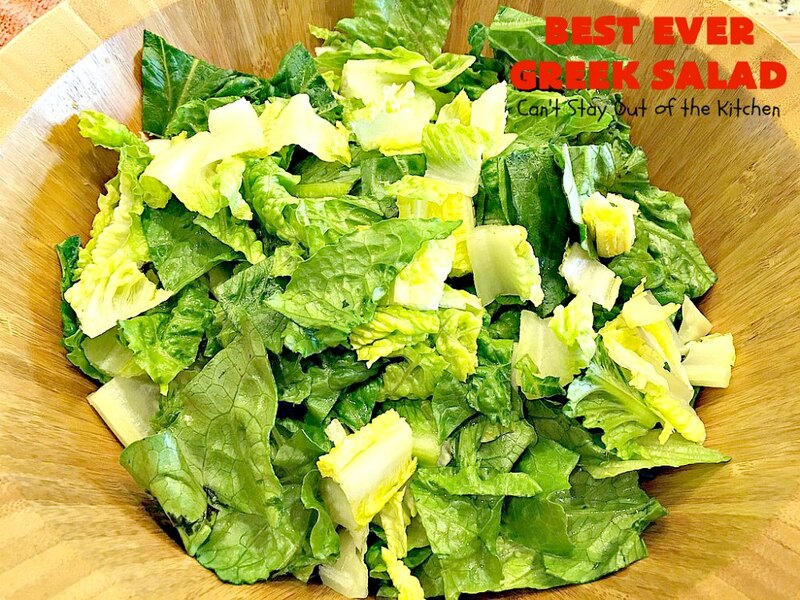 This salad is terrific for company, birthdays or holidays like Easter, Mother's Day or Father's Day. Gluten free. Add the dressing and pour over salad just before serving. Toss with salad before serving. Stir REALLY well before serving as this dressing separates. NOTE: If you like a sweeter salad dressing, increase the sugar to 1/2 cup. NOTE: I use honey regularly instead of sugar in the dressing and it works exceptionally well. NOTE: If you're not going to eat all the salad at once, just drizzle salad dressing over individual plates. 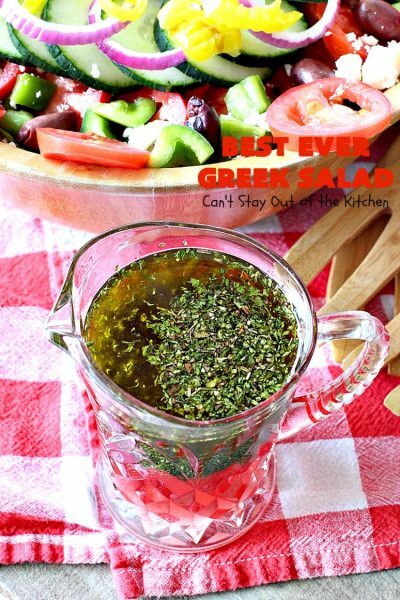 Amazing Greek Salad recipe with a delicious homemade dressing. Gluten free. If you like a sweeter salad dressing, increase the sugar to 1/2 cup. This is our family’s favorite salad! This salad dressing is absolutely wonderful. Best Ever Greek Salad is healthy, low calorie and gluten free. You can cut down the sugar in the dressing, too, if you’re concerned about sugar intake. Try this salad the next time you have company. It will be a winner with everyone! It is SO delicious, too. 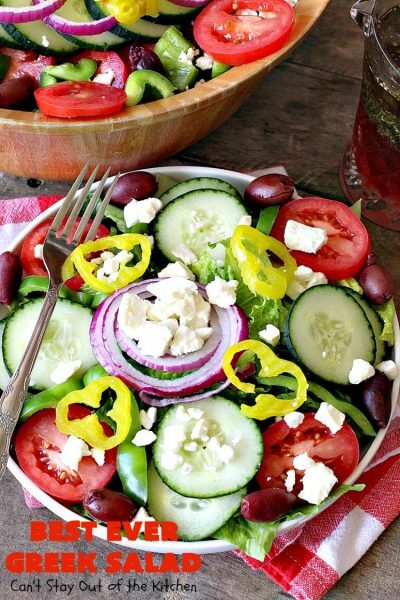 A great dinner salad for company, but we make it all the time for ourselves, too!